I neglected any mention of picture books in my last post, but my parents' have plenty of those too. The boys and I have been enjoying some of my old favorites. Anyway, since it had been so long, I opened it with some trepidation. You know what that's like, right? When you have such fond memories of something, but then when you come back to it years later, you realize it wasn't as wonderful as you remembered? I fully expected that to happen with this book. But it didn't! The nostalgia was thick and heavy in the room, so maybe I'm not the best judge, but I still really liked it. And Aaron and Maxwell really did, too. Unfortunately, the book is out of print, so even if it really is a good book, it is no longer readily available. In the same vein as There Was an Old Woman Who Swallowed a Fly, the story begins with a king (he wears a turban...where do you think he's from?) who sits down to enjoy his favorite food, cheese. 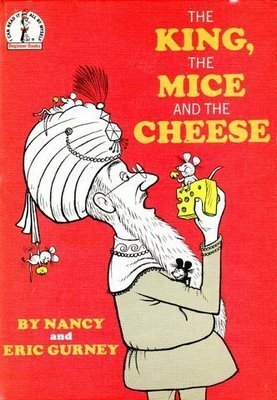 He is displeased to discover that mice have invaded the palace and enjoy his cheese as much as he does. His wise men solve the problem by bringing in an army of cats who do a great job of chasing out the mice, but then, well, then the king is stuck with dozens of cats...can you see where this is going? The illustrations are simple pen and ink with very little color added which lends itself well to some great expressions on the faces of the king and animals. The story has the potential to fall into a vicious cycle, but instead a solution is discovered which is both clever and agreeable to all parties involved. I don't know where my family got this book, but I can't find it in anywhere, so it seems to have come and gone without leaving much of a trace. From what I can tell, I don't know that it was ever even published in the United States, so maybe that explains some of its unavailability. 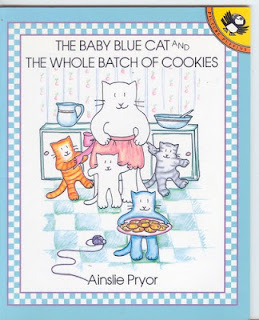 Apparently, there was a whole series about the baby blue cat, but this is the only one I ever knew. In this particular episode in Baby Blue Cat's life, Mama Cat has just made a big batch of cookies which Baby Blue Cat and his siblings will get to eat...right after playtime. But Baby Blue Cat loves cookies so much, he just can't wait. One cookie at a time, he eats his way through the whole plate. Let's move on from the ending, shall we? The real reason I like this book is because it is a great read-aloud. The words nip nip nip and gone gone gone are repeated many times, and it's easy for kids to join in. Also, there's plenty of suspense and excitement as the cookies gradually disappear. For some reason, this easy reader has almost instant kid appeal. I remember reading it over and over again as a child. And Max found it on this trip (another one of the books that resurfaced), and he and Aaron were completely engrossed through the first reading and have heard it several times since. 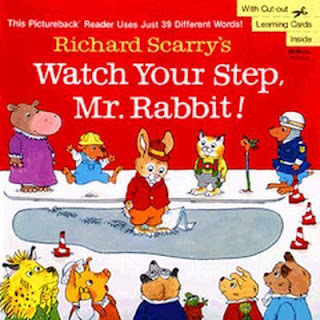 The storyline is simple: Mr. Rabbit accidentally walks into a patch of newly poured cement (he's busy reading his newspaper), and the town tries a variety of ways to get him unstuck. It's another good read-aloud because it asks questions, such as, "Can we push him out?" and my boys love giving the emphatic answer, "No!" Also, there is something so intriguing about wet cement. I can just see the wheels in Aaron's head turning, wondering if it really is possibly to get so permanently stuck by stepping into some cement. Mr. Rabbit doesn't really learn his lesson, so the book has a funny ending which my boys love as well. The problem with some easy readers is that, in an effort to make them simple, they really just become dumb...dumb stories and dialogue and sentence structure. That doesn't happen in this one; it's simple, yes, but engaging nonetheless. The thing that amuses me the most about it is that the patch of cement never stays quite the same size or shape from page to page. And why are they pouring a big blob of cement in the middle of the street anyway? What were some of your favorite books as a child? And have they stood the test of time? OMG I remember adoring Richard Scarry. I can not wait to discover him again with my kiddo. I had no idea there was another Baby Blue Cat book! I have to find it immediately! The Baby Blue Cat Who Said No was another of our favorite favorites! And I didn't think anyone else had really heard of it. Apparently we have very similar taste in books :) I don't remember Watch Your Step Mr. Rabbit, but Cars and Trucks and Things That Go (and searching for Goldbug) was very popular here, and I remember a book from my childhood which I loved that I think was Richard Scarry - Tinker And Tanker - have you ever heard of that one? I'm so glad to find another person who has heard of the Baby Blue Cat! My library doesn't have any of the other ones, which I'm really sad about. Yes, my boys love Richard Scarry's Things That Go, but I haven't heard of the Goldbug or Tinker and Tanker ones. We'll have to see if we can get them!